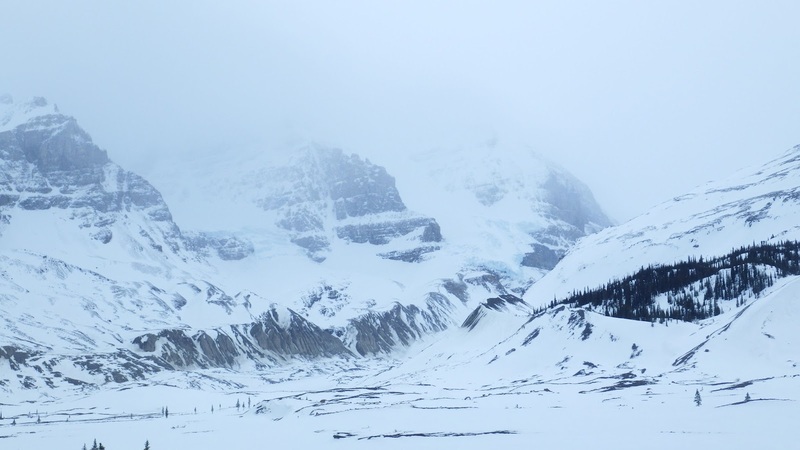 La Icefields Parkway (Highway 93) es la carretera de 234 km que atraviesa las Montañas Rocosas de Canadá siguiendo la Divisoria Continental de las Américas (los ríos al este de esta linea desembocan en el Atlántico y Ártico mientras que los que están al oeste desembocan en el Pacífico) que une los Parques Nacionales de Banff y Jasper y que comienza en Lake Louise, donde vivimos. Es una carretera revirada de un carril por sentido encajada entre altísimas montañas, lagos y glaciares. Un poco como todas las carreteras de las Rocosas, pero especialmente bonita. De hecho el nombre en castellano sería la carretera de los campos de hielo. 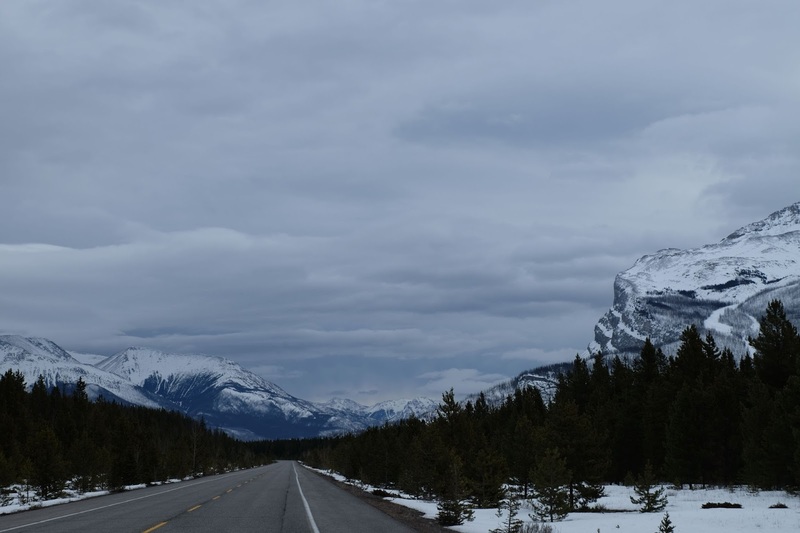 En condiciones normales no se deberían tardar más de tres horas en hacer los 234 km entre Lake Louise y Jasper, pero esta carretera es de las de parar casi en cada curva. Excepto en los tramos en los que está prohibido detenerse por estar en zona de avalanchas. El tema de las avalanchas es algo peliagudo ya que después de cada nevada cierran la carretera un par de días debido a que las inmensas avalanchas que se generan borran, literalmente, la carretera del mapa. Una de las primeras paradas obligatorias en el viaje desde Lake Louise hasta Jasper es el Bow Lake, que está completamente congelado, por lo que se puede pasear sobre él. Cuando fuimos nos encontramos con esquiadores que volvían de pasar tres días en los refugios de las montañas que lo rodean, aprovechando los últimos días antes de que los osos se despertasen. 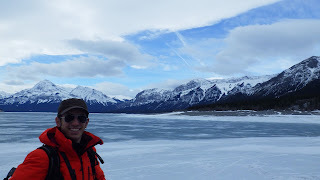 Para llegar hasta el Abraham Lake hay que desviarse por la carretera 11 desde el Saskatchewan Crossing. 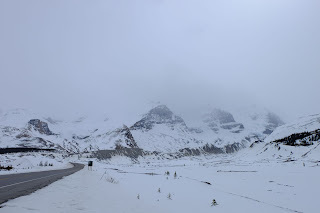 Es una carretera de estilo más comarcal pero, por algún motivo, con mucha menos nieve que la Icefields Parkway. Es un lago artificial formado en 1972 gracias a la construcción de la presa Bighorn famoso por el fenómeno de las burbujas de metano congeladas. Las plantas que se encuentran en su lecho todavía se están descomponiendo, generando metano. Las burbujas ascienden hacia la superficie y, al estar a punto de llegar, se congelan. Nosotros esto no lo sabíamos así que no buscamos las famosas burbujas, pero nos encontramos a un fotógrafo que sí las estaba buscando así que le echamos una mano. Al final llegó a la conclusión de que la capa de hielo era demasiado gruesa para que las plantas recibiesen luz solar; así que no vimos las famosas burbujitas. Estos son los campos de hielo que dan nombre a la carretera, que de hecho son los más grandes de las Montañas Rocosas. Tienen un area de 325 quilómetros cuadrados y reciben unos 7 metros de nieve al año, alimentando a 8 grandes glaciares incluyendo los famosos Columbia, Saskatchewan, Castleguard, Dome, Stutfield y Athabasca. Nosotros nunca habíamos oido hablar de ninguno de estos glaciares, pero por aquí son muy populares. Los campos de hielo son conocidos también como la madre de los ríos ya que están situados justo encima de la Divisoria Continental por lo que nutren de agua a ríos que desembocan en todas las costas de Canadá y Alaska. Es una zona muy expuesta por lo que cuando fuimos hacía mucho viento. Aún así intentamos llegar hasta el Athabasca, en lo que es presumiblemente una caminata sencilla. 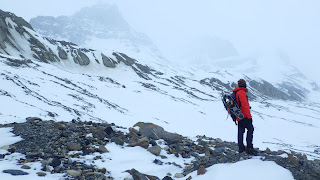 Fuimos con raquetas de nieve, crampones, bastones y muchas ganas. Pero entre el viento, el frío, las rocas que caían constantemente de las morrenas y la maquinaria pesada que estaba adecentando el acceso para los super autobuses que circulan sobre el glaciar en verano, decidimos darnos la vuelta después de casi dos horas avanzando a duras penas. El paseo mereció la pena por la aventura de caminar por una zona que en Nueva Zelanda habría estado poblada de carteles avisando de lo peligrosísimo de la empresa y, obviamente, por el paisaje extremo en el que estábamos. 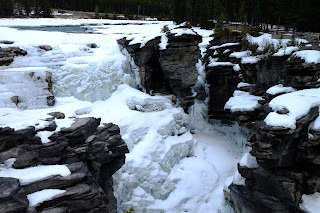 Justo antes de llegar a Jasper se encuentran las cataratas del río Athabasca, que no son las del Niágara, pero como se congelan durante el invierno pues se pueden ver con más calma, entre otras cosas, porque no hacen nada de ruido. Tienen montado un paseo por el cañón que se ha formado después de siglos de tortura china del agua sobre las rocas de granito. Por lo que parece cada cierto tiempo muere alguien haciéndose el valiente caminando sobre las my resbaladizas cataratas congeladas, es lo que se llama selección natural, motivo por el cual cada rincón del cañón tienen un cartelito donde te recuerdan que el hielo resbala y que si te caes no te va a ir a buscar nadie en menos de 3 minutos, que es lo que tardas en quedarte como Di Caprio en Titanic. 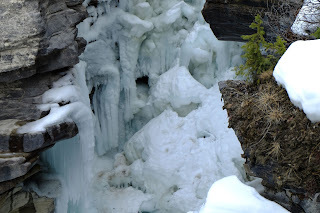 Y así, entre glaciares, cataratas congeladas, avalanchas y muchas montañas llegamos a Jasper, un pueblecito muy pintoresco, con una estación de tren, ciervos por las calles y muchas montañas que explorar situado en medio de la nada al que tendremos que volver en verano. The Icefields Parkway (HWY 93) is a 234 km long road that crosses the Rocky Mountains of Canada following the American Continental Divide (east of this line all the rivers flow into the Atlantic or Arctic while on the west of it all of them reach the Pacific instead). 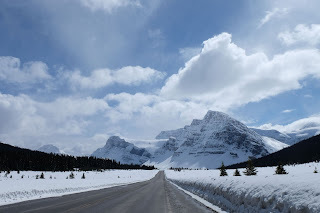 The road links the National Parks of Banff and Jasper and merges right and out of the HWY 1 in Lake Louise, where we live. It’s a windy road with one lane per direction locked in-between very high mountains, lakes and glaciers. Well, that’s not so different from the rest of the Canadian mountains, but this one is particularly scenic. 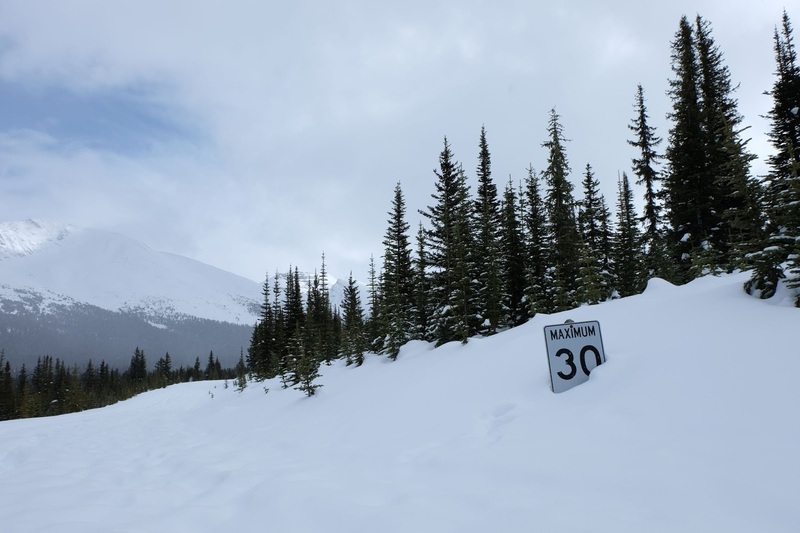 In good driving conditions it doesn’t take any longer than three hours to cover the 234 km between Lake Louise and Jasper. However, this is the kind of road that you really want to stop after every single bend to take in all its beauty. That’s of course with the exception of the numerous parts of avalanche areas, there you don’t want to stop the car. Avalanches in Canada are no joke at all. After a big snowfall and specially in Spring time, the road is closed because avalanches can literally erase the highway out of the map. After artificially causing avalanches with dynamite and doing the right maintenance, the road gets open again and it’s safe to drive on. 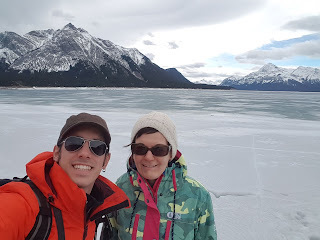 The first mandatory stop is at Bow Lake, which was completely frozen at the time we visit. 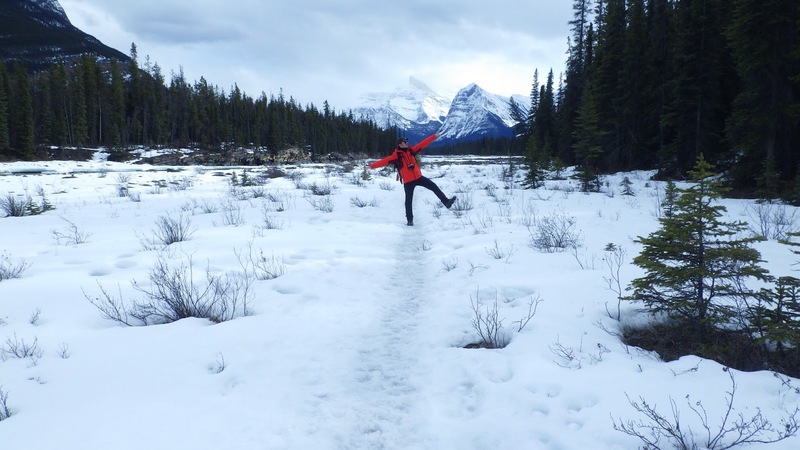 As in Lake Louise, one can walk over its surface safely. That day we met a couple of skiers coming back from the Bow Hut where they spent the last three days exploring and skiing while taking advantage that the bears were still sleeping. 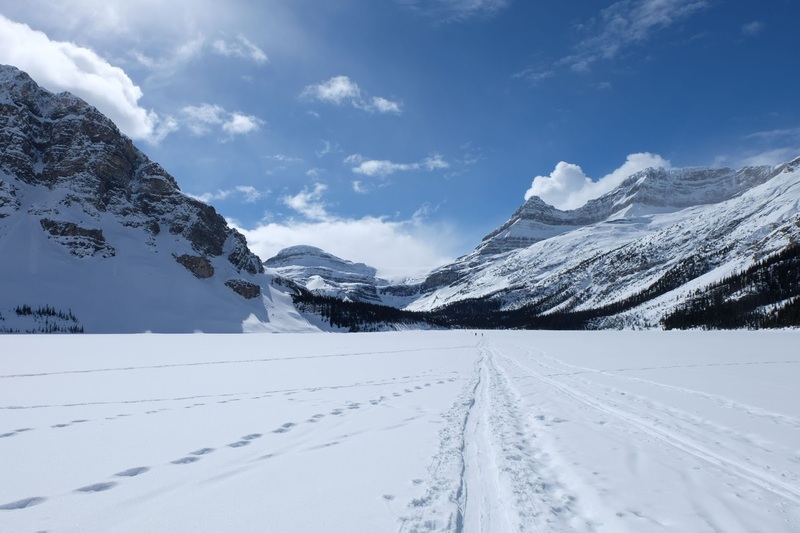 At the Saskatchewan Crossing, take the HWY 11 on the right when driving from Lake Louise to Jasper to find Abraham lake. It looks like a not so major road, with less traffic and, for some reason, there was less snow on it compared with Lake Louise and the road to Banff. It is an artificial lake appeared in 1972 after the Bighorn dam was built and it’s well known for its frozen methane bubbles. The submerged plants are still decomposing and during the process the methane released gets captured in the ice covering the surface during the winter months. The bubbles make it to the surface but they get locked there and eventually all the water freezes around them. We had no idea about this phenomenon, so we didn’t go around the lake looking for this bubbles. We discover about it when another visitor told us about it on site. We had a peek with him but nothing interesting could be seen. 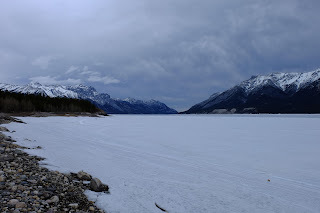 The ice cover was too thick and there was also some snow covering the surface. Besides, it is warm enough now and the ice is starting to crack so walking on it didn’t seem safe to us, hence we didn’t dare to step on it. These are the ice plaques than give its name to the road and they’re actually the largest in the Rockies. 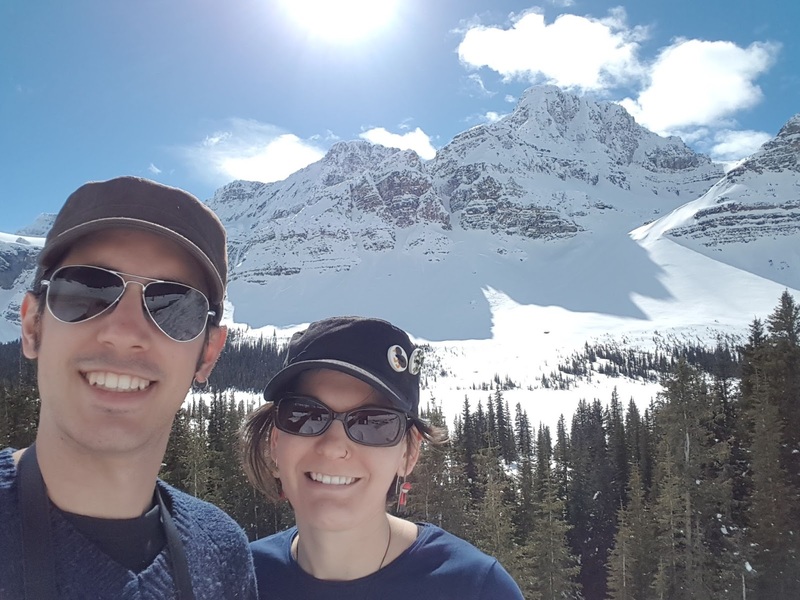 They cover 325 square kilometres and get about 7 metres of snow per year, feeding 8 large glaciers including Columbia, Saskatchewan, Castleguard, Dome, Stutfield and Athabasca. Honestly, we didn’t know about these glaciers before but they seem to be very well know at least in this area. These icefields are known too as the rivers’ mothers because they’re located just above the American Continental Divide and they feed all the rivers flowing in Canada and Alaska. It is a very exposed area and it seems to be always windy. 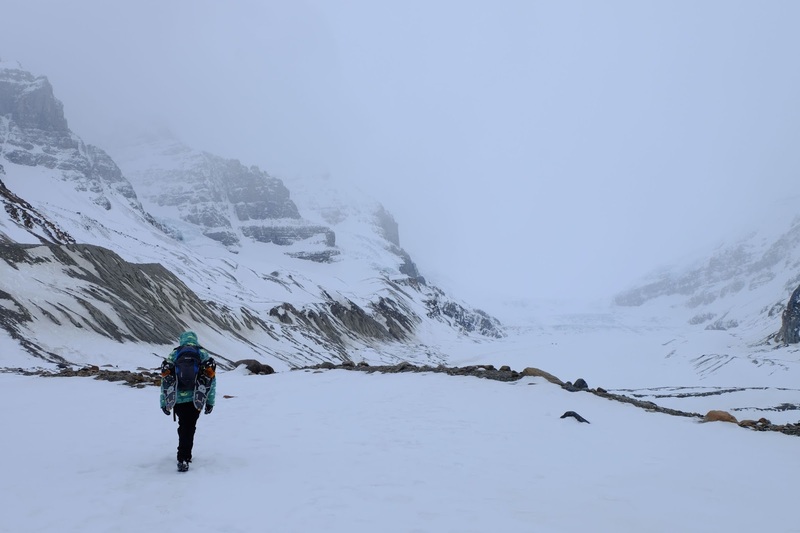 Despite the conditions, we tried to reach Athabasca’s toe following what looked like and easy hike. We had winter boots and crampons on and carried snowshoes, walking poles and lots of energy. But the wind, the cold, the stones rolling down the slope of the moraine and the noise of the heavy machinery working on the summer road put us off after walking for about two hours without getting much closer to the front of the glacier. The little walk was cool anyway and it was a pretty nice feeling to walk over a type of terrain that in our beloved New Zealand would have been covered with signs telling about the several dangers of walking there (such as huge rocks falling down from the sky). Only a few kilometres before Jasper there’s this set of falls in the Athabasca river. They might not be as long as the ones we saw in New Zealand or as wide as in Niagara but they freeze in the winter which makes the viewing particularly nice and quiet besides the spectacular shapes formed, of course. There’s a boardwalk around the canyon made after years of water eroding the granite rock. 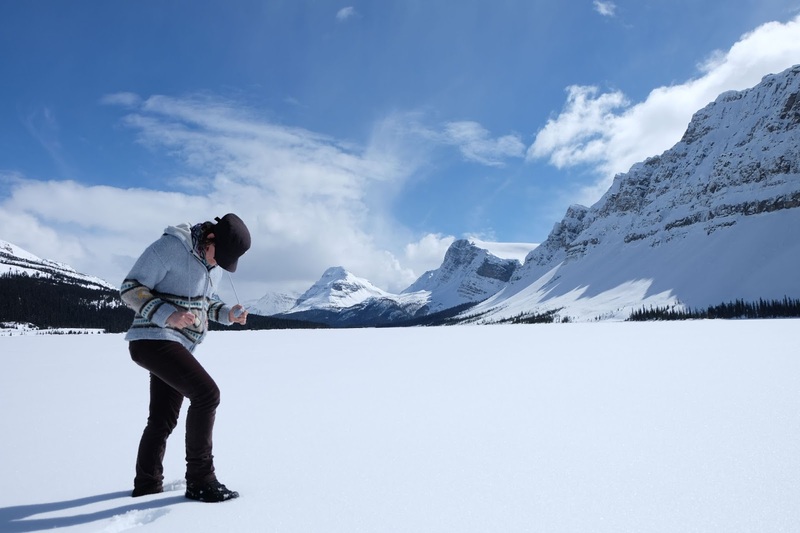 It seems that every now and then someone dies while playing the fool walking over the frozen water. Kids, that’s really what is called natural selection. Anyway, there were boards telling you to stay on the track for your own safety pretty much in every corner. Because ice is slippery and if you fall no one is going to be able to rescue you in less than three minutes which is the time it will take you to become like Di Caprio in Titanic or to break your neck. 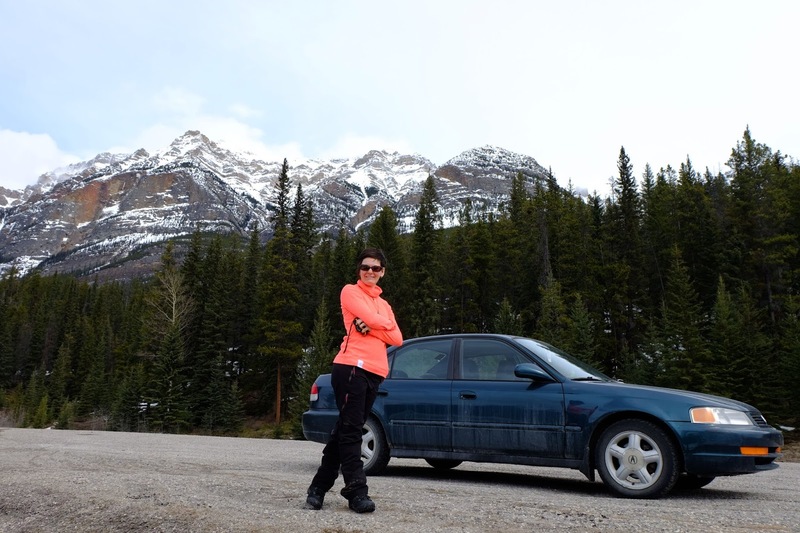 And that’s how our drive by glaciers, iced waterfalls, avalanches and mountains to Jasper was. What a sweet little town Jasper is with its train station, all those mountains and deer pasturing on the sidewalk. We’ll definitively have to visit again in the summer. Una excursión muy bonita, lástima tanto frío. Las fotos muy chulas. Hola fue en mayo el viaje?? A finales de abril. 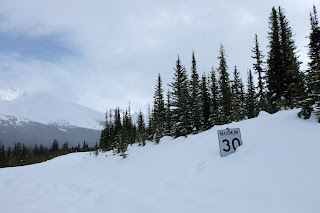 La carretera está muy bonita tanto en invierno como en verano, pero en invierno hay que llevar pneumáticos de nieve; en canadá no se usan cadenas. abril es buena época para ir a conocer Jasper y Banff y sus alrededores? Nos da miedo encontrarnos muchas carreteras cerradas y no poder visitar los lugares. Que os pongan pneumáticos de invierno en el coche. Si cierran alguna carretera es por avalanchas, que son más hacia finales de mayo y principio de junio.